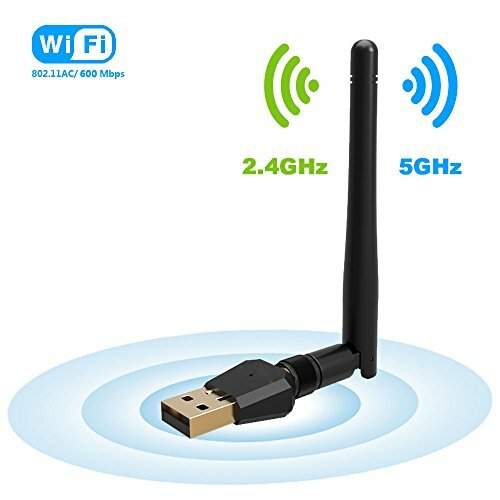 600Mbps wireless USB wifi adapter. 433Mbps on 5GHz and 150Mbps on 2.4GHz. High transmission speed guarantee seamless and lag-free HD streaming, online gaming and other bandwidth-intensive tasks. Fast Transmission: 600Mbps wireless speed with 802.11ac and Dual-band connections, 433Mbps on 5GHz & 150Mbps on 2.4GHz. Provide fast connection and transmission for your network. High Gain Antenna: High Gain Long-Range antenna help connect when signal weak, help improve the signal when your computer is too far from your wireless router or with walls. Perfect for Lag-free HD Video Streaming and Gaming. Universal Compatibility: Compatible with almost all kinds wireless routers. Support Windows xp/7/8/10, MAC, OSX. Easy Use & Easy Installation: Setup CD included. Just run the software, and you can simply insert the adapter to get connected. It is a very small device and you will even ignore it when you use. Support WPS one key encryption, not only free you from remembering long passwords but also guarantee network security. Note: We provide one year guarantee for all customers. Please contact us if you have any question or problem. We will provide best services to you.